MADE IN BERWYN HEIGHTS – BRICKS? Example of cargo cableway in coal mining. Ropeways were an important means of transportation during the early 1900s. To get the brick making business underway, Yoder granted an equal share in the properties to Clayton E. Emig (1862-1940), a prominent D.C. Lawyer and President of the North Washington Citizen Association. The properties were subject to a first lien of $7,775 out of the money arising from the organization of the brick factory, payable to Yoder before Emig and the Columbia Brick Company would reap any benefit out of the premises.3 Although the brick factory and cargo tramway were not built, it shows that other futures were possible for this now quiet, residential community. The land granted to Emig was later absorbed by the Berwyn Heights Company. 1 “Large Brick Plant Building at Berwyn,” The Washington Times, 3 March 1907, p. 6. 2 “Development at Berwyn,” Evening Star, 16 June 1906, p.2. and “Growth of Hyattsville” [and adjacent communities], Evening Star, 8 April 1906, p. 7. The remnants of the old central files of the Town of Berwyn Heights contain a document dated 1928 and entitled “Lots and Owners in the Town of Berwyn Heights, Prince George’s County, MD.” It is a list of property owners, arranged by block and lot, assembled for the purpose of assessment and taxation. Interesting in many respects, it is noteworthy for showing a very large number of lots belonging to the Berwyn Heights Company. How did this come about? The Berwyn Heights Company was incorporated in November 1919 to buy, sell and improve real estate in Berwyn Heights. Fred Benson was President, Elwood Taylor, Vice President, William Willard, Secretary and John McNitt Treasurer. John Gardiner acted as General Counsel. Major Clarence Benson, son of Fred and Margeret Benson, also served on the board and would later become President.1 All these men were also key members of the Berwyn Heights (Citizens) Association, which they helped establish in 1915. Poultny was a core member of the United Realty management team, and served variously as President, Vice President and Secretary. His name appears on many deeds of the properties United Realty purchased from the Tome Institute starting in 1906. Benson had worked with Poultney in the Office of the Secretary of the Treasury Department,7 and after earning his law degree from Columbian University (George Washington University) in 1905, became a partner in a D.C. law firm with Richard P. Evans and William W. Poultney.8 In October 1909, Benson and Poultney incorporated the Berwyn Heights Building & Improvement Company with Robert Armour, Charles Eldridge and William Smyser, who also served on the board of United Realty.9 In short, Fred Benson had a close and long-standing connection with the group of investors that sought to restart the development of Berwyn Heights. So, when a big chunk of United Realty properties were sold at auction, the Berwyn Heights Company was ready to buy them. 1 Minutes of the First Meeting of the Board of Directors, Berwyn Heights Company (BH Co.) Minute Book, 20 November 1919. 2 “Berwyn Heights Company Purchases 125 Acres,” Evening Star, 1 November 1919. and Deed dated 28 October 1919, J.S.T. Waters et.al. Trustee to BH Co, Prince George’s County Land Records, Book 168, p. 148. 3 Deed dated 28 October 1919, A.J. Wiegman to J. McNitt, PGC Land Records, Book 143, p. 166. 4 Assignment dated 17 February 1920, C.E. Emig to BH Co., PGC Land Records, Book 151, p. 43. 5 “Berwyn Heights, A Suburb of Washington, D.C., the Nation’s Capital,” United Realty Co. Pamphlet, ca. 1906, p. 12. 6 Deed 3 July 1907, W.W. Poultney to F.H. Benson, PGC Land Records, Book 40, p. 360. 7 U.S. Register of Civil, Military and Naval Service, 1901, p. 61. 8 Law Firm Advertisement, The Washington Herald, 3 January 1907, p. 3. 9 Incorporation Notice, The Washington Herald, 29 October 1909, p. 11. On May 6, 1906, the real estate section of The Washington Times featured Berwyn Heights on page 1, 3 and 8, including a full page advertisement offering properties for sale. Quarter acre lots were sold for the price of $250, inclusive a $100 equity in the Berwyn Land & Manufacturing Corporation, set up to develop the subdivision. Berwyn Heights, with its convenient access to Washington D.C., was described as a money making suburb because investors would benefit from both, the certain increase in property values and an increase in dividends. The write-up seemed to work: one month later, a notice in The Washington Times thanked the paper for helping to sell 170 lots in Berwyn Heights. Waugh Mansion. Purchased by Congressman Yoder, 1906. The ads and notice were placed by former Congressman Samuel S. Yoder, who had recently purchased the holdings of the Jacob Tome Institute in Berwyn Heights, comprising about 275 acres or about 2/3 of the all the available land in the Town. Jacob Tome had financed the real estate dealings of James E. Waugh, one of the original developers of Charlton Heights, and after his death, Waugh’s properties passed to the Institute. 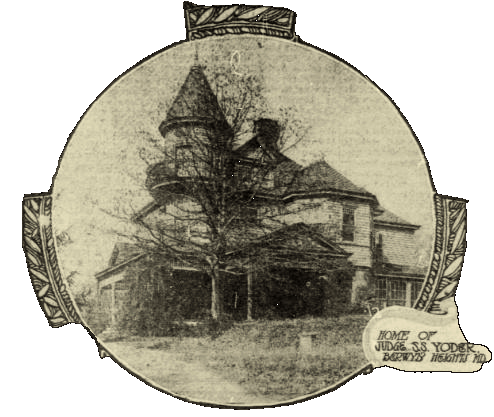 Among the Tome properties Yoder acquired was the Waugh mansion on the eastern edge of Berwyn Heights, which became his country home. Yoder’s purchase of the Tome Institute lands and the creation of the Berwyn Land & Manufacturing Corporation were part of a larger plan to profit from the tremendous expansion of Washington that occurred in the first decade of the 20th century. City people were flooding into the suburbs looking for affordable homes. The Berwyn Land & Manufacturing Corporation was intended to finance improvements in the subdivision to make it more attractive to prospective home buyers. But it was also meant to promote industry that made use of raw materials available in the area. Brick, tile and cement block factories were on the drawing board to supply the construction trade in the booming Hyattsville region. Another part of the plan, was to build a streetcar, the Washington, Spa Spring and Gretta Railroad (WSSGRR), east of the Baltimore & Ohio (B&O) Railroad that would serve Berwyn Heights proper and several communities on the way. Streetcars were the principle means of transportation in the city before the arrival of the automobile, and made it possible for the middle class to relocate to the suburbs while continuing to work and shop downtown. So far, this process had largely played itself out in the areas northwest of the District, but by 1905 growth was shifting to the east of Washington, where Hyattsville was becoming a regional center of industry and commerce. Prominent citizens in and around Hyattsville joined with Yoder, who lived in the District, to organize WSSGRR. They owned land, ran businesses, held leading positions on the Hyattsville City Council and in the government of Prince George’s County and the State of Maryland. In light of the fast growth of the area, a streetcar connection from Washington to develop the “neglected” areas east of the B & O Railroad appeared to make sense. 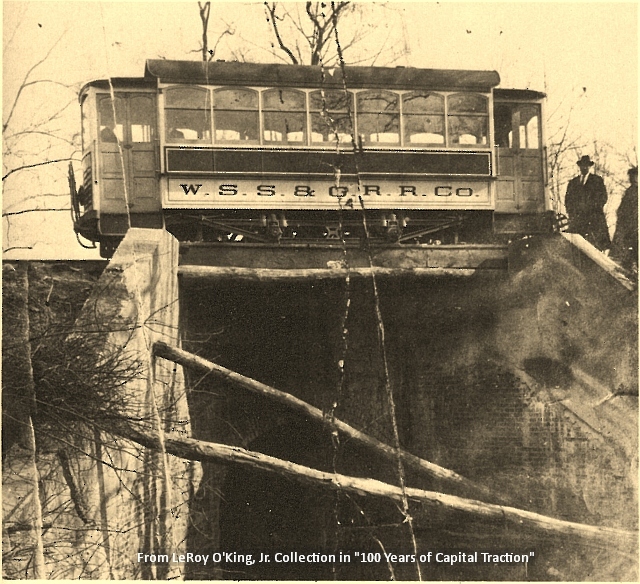 The Washington Spa Spring & Gretta Railroad (WSSGRR), the streetcar that came to Berwyn Heights in the 1910s, had one of the more memorable names of the many streetcar lines in the Washington area at the turn of the 20th century. But what does it signify? The key to the name, as might be expected, are the places connected by the streetcar. Washington at 15th and H Street, NE near the old District boundary was one end point of the line. In addition to 15th and H Street, Maryland Avenue, Florida Avenue, Benning Road and Bladensburg Road converged here to form a big “starburst” intersection where passengers could transfer to other lines that went into the city center. At the time, the residents of East Washington felt they were under-served by the city’s street car system, and through their citizen associations strongly lobbied for better service and for a “cross-town line.” In February 1907, they got Congress to pass a law permitting WSSGRR to enter the District. Congressman Samuel S. Yoder, also a resident of East Washington and future President of WSSGRR, thanked the East Washington Citizen Association for supporting the bill and offered for WSSGRR to build the cross-town line. Spa Spring refers to the Bladensburg Spa Spring located on the eastern bank of the Northeast Branch of the Anacostia River. In the 19th century, it was a popular tourist destination, and was visited by many for its alleged curative powers. An old Hopkins Atlas shows the location of the spring as well the concentration of businesses near it, including a Spa Spring Hotel. Gretta refers to the homestead of Benjamin D. Stephen located east of Riverdale on the old Edmonston Road. Stephen was the Clerk of the Prince George’s Circuit Court at the time the streetcar was organized, and was elected as the first President of WSSGRR. Later, he conveyed Gretta to his oldest son Frank M. Stephen and two associates, who would plat the Gretta Addition to Riverdale, bounded on the west by the Eastern Branch, on the east by Edmonston Road, and in the south by Riverdale Road. Berwyn Heights is notable for not being mentioned. A possible reason is that, in February 1905, when WSSGRR was incorporated in Maryland, it was not yet part of the plans. The certificate of incorporation describes the proposed streetcar route as “beginning at the District line, on the Baltimore and Washington Turnpike, where said line crosses the Pike at Colonel Reeve’s; then with the Pike through the Town of Bladensburg to the Edmonston Road; thence with said road or near thereto northerly to Gretta, a point on said road about one mile north of where the Riverdale Road leaves the Edmonston Road.” Berwyn Heights may have become a destination only after Yoder bought up properties in Berwyn Heights starting in late 1905 and became Vice President of WSSGRR, when the executive board was elected on April 2, 1907.